I receive a ton of inquiries for multi-location SEO. 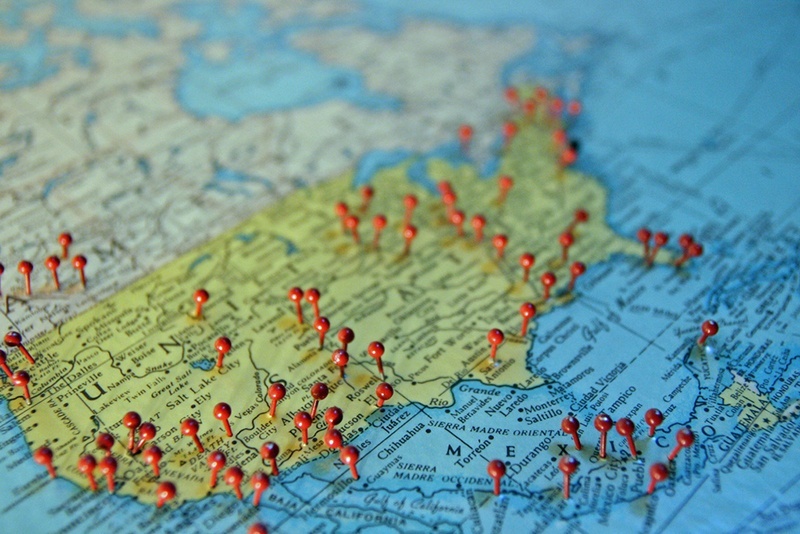 Some are small, single location businesses looking to expand into new territory, while others are national franchises with 50+ locations spread across the US. Over the years I’ve written several posts on multi-location SEO, but like most aspects of online marketing, the rules and best practices change over time. I won’t bore you with stats you’ve probably heard over and over again or platitudes about how important local SEO is for your business, because let’s face it: local SEO is no longer optional. Instead I provided some practical tips to help you maximize the value of your multi-location SEO strategy. Even if your site has a solid domain authority and ranks well for your generic search terms, if you’re trying get one service page to rank for several different locations, chances are you’re diluting your efforts. Google and other major search engines use location data to improve the relevancy of search results – especially for mobile users. In addition to improving your local SEO, you can also improve conversion rates by providing a more targeted and relevant user experience. One of the most effective multi-location SEO strategies is creating a unique landing page for each region. This way you can optimize the entire page for one specific market. This includes optimizing some of the major page elements, such as h1’s, title tags and image alt tags, as well as the actual content itself. In addition to the organic SEO benefits, these localized landing pages can be effective if used in conjunction with localized PPC campaigns. Instead of sending all clicks to one centralized service page, you can send paid traffic to a page that’s optimized for the searcher’s specific location. Google My Business is the holy grail of online business directories. I’ve seen clients triple their organic traffic as a direct result of creating a Google local listing. The reason these listings are so valuable is because Google integrates them into search results, and typically includes them above the fold – so they’re the first thing a user sees when searching for a local business. Many SEOs refer to these listings as ‘local packs’. Local packs typically contain anywhere from 3-7 listings, depending on the search query. The best part is the business name is linked to the website – not just the Google My Business listing – so they can drive a significant amount of organic traffic. Local packs also display reviews, a link to your Google+ business page, and sometimes include a map that shows where each business is located. All of these features help make your listing stand out in search results. For businesses with multiple locations, using one listing simply isn’t practical. I worked with a large company that had one Google My Business listing for their corporate headquarters – where they didn’t even serve customers – and not a single listing for any of their other locations – where they did serve customers. The result? Their business wasn’t included in the local packs for any of the markets they were targeting. Fortunately, it’s relatively easy to create a unique listing for each location. Google even put together a set of guidelines that outlines some of the best practices for multi-location businesses, based on the type of business, such as chains (i.e. Starbucks), two brands working out of the same location (i.e. Baskin Robbins/Dunkin Donuts), and individual practitioners (i.e. lawyers, doctors, real estate, etc.). Keep in mind that having a listing doesn’t guarantee inclusion in the local pack. In fact, it’s not even guaranteed that a local pack will display. Recently, there have been multiple reports suggesting that local packs have declined since last year’s Pigeon update. Just like traditional search results, visibility depends on several factors. The good news is that there are steps you can take to ensure that your listing is optimized to help increase the likelihood of it appearing in the local pack. Use a unique phone number. When you share an area code with your target audience, you build credibility. You also save yourself the risk of having one phone number associated a bunch of different locations across the web. This also helps with citation consistency, which I’ll talk more about later. Encourage reviews – lots of them. Reviews and other types of Google+ rich snippets get more clicks in search. A good place to start is by reaching out to any customer with a Gmail address. All Gmail users have Google+ profiles associated with their accounts, so it makes it easier for them to leave a review for your business. You can also include links to your Google My Business page in emails, on your website and on other social channels, such as Facebook and Twitter. Optimize categories – Use them wisely. When it comes to Google My Business categories, less is always more. Try to limit to as few as possible. The more categories you add, the more you dilute the value of each one. Make your profile stand out. Always include descriptions, photos, videos, hours of operation, payment types accepted, and anything else that might be useful for potential customers. I’d also recommend adding a virtual tour for each location, if possible. They add a nice flare to your page. Citation consistency is extremely important for local SEO, but managing hundreds of citations across the web can be tricky – especially for multi-location businesses. The more that a business keeps there citations consistent, the higher their search engine visibility. Some directory sites automatically generate profiles, which can either contain erroneous information or create duplicate citation issues. That’s one reason why I would recommend using a local citation service like Yext, Whitespark or Moz Local, so that you can manage all of your listings for each of your locations from one centralized platform. Most of these services cost money, but if you’re on a tight budget, you can still manage the majority of your citations manually – it just may take a little bit more time. Generally speaking, if a business has multiple locations, the majority of the content on their site is location-neutral. Google’s ability to decode user intent has come a long way in recent years. One of the ways Google does this is by attempting to understand which specific city or geographic region that content is targeting. Reviews – If you’re funneling all of your reviews to one central location, you’re making it harder for potential customers to find the reviews that are most relevant to them. Also, when you assign reviews to their respective locations, you eliminate the risk of a few negative reviews ruining your brands overall reputation. From a local SEO perspective, localized reviews create additional local ranking signals, which can increase local visibility for each of your target markets. Clients and testimonials – B2B brands that list their current and past clients on their websites can build trust and credibility within their local markets. I’ve had several clients ask me if I have experience working with other clients in their area. For B2C clients, it’s always a good sign when potential customers see testimonials from satisfied customers from their hometown. Images – You can also include photos of your individual stores or offices, and even include pictures of your staff for each location. This also helps build credibility by showing potential customers that you have real locations with a real staff. I’ve worked with clients that have been burned in the past by companies that claim to have multiple locations, only to find out it’s a constellation of virtual offices. This is really important for international brands. Links – It’s always a good idea to seek out linking opportunities with sites that cater to your specific demographic. This includes news sites, local blogs, business directories and other businesses that are based in your target markets. This also helps diversify your back-link profile. Social – I wouldn’t recommend that every business creates location-specific social channels – only those with the time and resources to devote to managing them all. I’ve found that engagement varies depending on your audience, including where they live. The more you can localize your social presence, the better. Local SEO isn’t easy. There are quite a few moving parts and it’s important to have a solid understanding of how they all work together in order to rank well for your target markets. If you’re interested in learning more about local SEO, I would recommend reading some posts by local SEO gurus like David Mihm, Linda Buquet or Andrew Shotland. They’re all very knowledgeable on the subject and regularly post about local SEO news and trends. If you’re looking to hire someone for multi-location SEO services, I would be more than happy to schedule a call to talk about your business and how we can help. Drop us a line and we’ll be in touch. If you have any questions, feel free to leave a note in the comments section below.